December was a down month for Houston real estate, but the city’s full-year 2018 numbers were record-setting. 2017 was an incredibly resilient year for Houston real estate, as even with the devastating and disruptive effects of Hurricane Harvey, the year set a new record for home sales. Following that impressive performance, there was a certain level of optimism about the market going into 2018, but with outstanding numbers pretty much across the board, it seems safe to say 2018 exceeded expectations. In addition to the market producing another record-setting number of single-family home sales, median and average home prices increased as well. HAR’s latest report covers the 2018 numbers as a whole, but it also touches on December’s stats, which were a bit of a mixed bag. December single-family home sales decreased 4.1 percent, year-over-year, from 6,825 to 6,543. 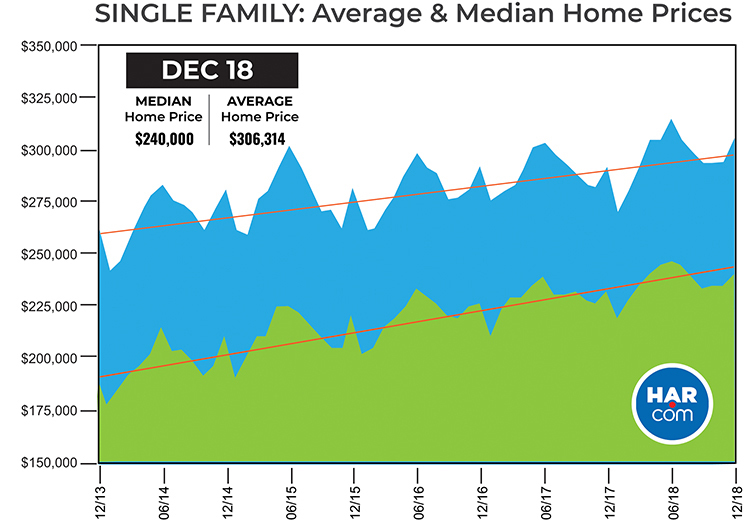 Prices, both median and average, rose to all-time December highs, with median increasing 3.4 percent to $240,000 and average climbing 4.7 percent, up to $306,314. At 3.5-months supply, inventory at month’s end was higher than the 3.2-months supply of a year before, but still below the current national supply of 3.9-months. While December was a bit sluggish, it was 1 of only 4 months in 2018 that didn’t produce a year-over-year increase in single-family home sales. On the backs of the 8 months that did generate positive home sales (including Houston’s greatest month of sales ever in June), a new record of 82,177 homes were sold in 2018. That amounts to a rather significant 3.8 percent increase over the previous record for sales set just one year before. 2018 median price for single-family home sales was $237,500, or 3.3 percent higher than the 2017 median price. Average sales price in 2018 nearly reached $300K, rising 2.6 percent to $298,982. The higher prices and record-setting sales combined to create a total dollar volume of a little over $28 billion, which was a whopping 21.5 percent higher than 2017, and another all-time high for Houston. Buying or selling a home or just have questions about the market? Give me a call at 713.829.3052 or email me at cynthia@cynthiamullins.com.